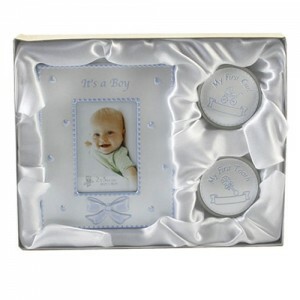 baptism, naming ceremony or baby shower! The 1st says: My First Curl and has a blue pram and scroll on the cream front. The 2nd says:My First Tooth and has a blue rattle and scroll on the cream front. The photo frame is cream, with a blue edging and small pink hearts and blue bow detail.